The Girl Who Kicked the Hornet's Nest provided a very satisfying ending to this trilogy. I would say this was my favorite of the three books, although The Girl Who Played with Fire is right up there with it. To me, they got better as they went along. The Girl with the Dragon Tattoowas great, but it was pretty complicated and filled with too much sexual violence for my liking. The Girl Who Played with Fire was much easier to follow along with, although I still felt lost at times, and it wasn't as disturbing in terms of violence. 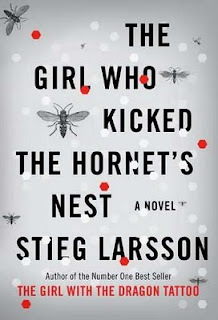 The Girl Who Kicked the Hornet's Nest was the easiest for me to keep up with and, therefore, the easiest to read. I never once felt lost or confused, which was a nice change! This book is almost like a legal thriller in that most of the book is spent trying to find a way to clear Salander's name before she goes to trial. There's plenty of action and intrigue, though, as events unfold to finally reveal the truth of what's been going on in the background of all of the books. If you've read the first two books in this trilogy, I'm sure you'll be reading this one. If you only read the first book, but found it too violent, I'd recommend at least trying the next two. They do get easier and less disturbing as they go along! As for me, I absolutely loved The Girl Who Kicked the Hornet's Nest and am very sad to know that I won't be able to read anything else by Stieg Larsson in the future. This review was written based on a copy of The Girl Who Kicked the Hornet's Nest that I borrowed from a friend. I loved this series also and would agree the first was the hardest to get into but aside from the violence, I found the background info tough to read. I understand it was integral to the story but I can see people giving up on it if they can't get into it!